Vivo launched the V3 smartphone in india at a price tag of Rs. 17,980 back in April, 2016 and Xiaomi launched the Redmi Note 3 in India at a starting price tag of Rs. 9,999 back in March, 2016. In the month of July, Vivo V3 officially gets a price cut of Rs. 3000 and it is available at a price tag of Rs. 14,980 while the Xiaomi Redmi 3 haven’t received a price cut till date. The Xiaomi Redmi Note 3 comes in two variant – 2GB RAM with 16GB in-built memory costs Rs. 9,999 while the 3GB RAM with 32GB in-built memory costs Rs. 11,999. In the price bracket of Rs. 15,000 Vivo V3 & the Xiaomi Redmi Note3 smartphone compete with each other and based on the specifications comparing both the smartphone. This comparison helps you to choose the best smartphone and saves awful amount of money. The Vivo V3 features 5-inch HD display with a resolution of 1280 x 720 pixels while the Xiaomi Redmi Note 3 features 5.5-inch Full HD IPS display with a resolution of 1920 x 1080 pixels with 178 degree viewing angle. Reason to Choose: On the display front, the Xiaomi Redmi Note 3 is the winner as it comes with Full HD display instead of HD display. The Vivo V3 is powered by 1.5GHz Octa-Core Qualcomm Snapdragon 616 processor which is paired with Adreno 405 GPU while the Xiaomi Redmi Note 3 is powered by 1.8GHz Hexa-Core Qualcomm Snapdragon 650 64-bit processor with Adreno 510 GPU. On AnTuTu, Vivo V3 scores 39901 while the Xiaomi Redmi Note 3 scores 74,303. On AnTuTu, XIaomi Redmi Note 3 scores twice the number when compared with Vivo V3. 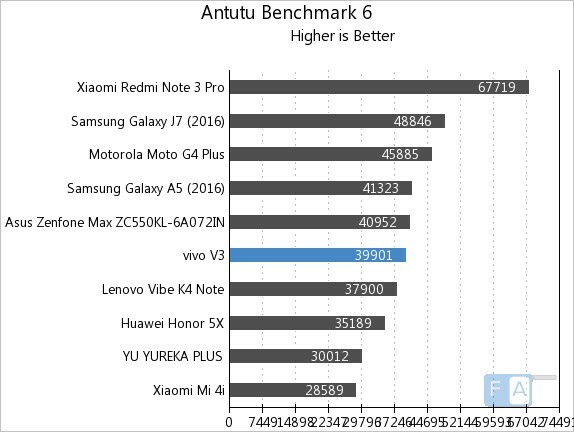 Reason to Choose: According to AnTuTu Benchmark, the higher score you have much better is the performance (reference – Makeuseof.com). So, the XIaomi Redmi Note 3 is the winner when it comes to performance. The Vivo V3 has 3GB of RAM and 32GB in-built memory which can be expanded further up to 128GB via microSD card. The Xiaomi Redmi Note 3 comes in two variant – 2GB RAM with 16GB in-built memory while the other is 3GB RAM with 32GB in-built memory, the in-built memory can be expanded further up to 128GB via microSD card. Reason to Choose: Both the smartphone has same in-built memory (if we talk about Xiaomi Redmi Note 3, 3GB RAM with 32GB in-built memory variant). I recommend you to choose, XIaomi Redmi Note 3 it’s because it is much cheaper when it comes to Vivo V3. The Vivo V3 features 13-megapixel rear-camera with dual-LED Flash & PDAF and 8MP front-facing camera for selfie & video-calling. The Xiaomi Redmi Note 3 has 16MP rear camera with dual-tone LED Flash and 5MP front-facing camera for selfie & video-calling. Reason to Choose: When it comes to rear-camera Xiaomi Redmi Note 3 has edge over Vivo V3 while when it comes to front-camera, Vivo V3 has edge over Xiaomi Redmi Note 3. I recommend you to choose Xiaomi Redmi Note 3 it’s because you can save money. The Vivo V3 runs on Android 5.1 Lollipop operating system with FunTouch OS 2.5 on top of it. The XIaomi Redmi Note 3 runs on Android 5.1 Lollipop operating system with MiUI 7.0 on top of it. Reason to Choose: Both the smartphone runs on same Android version but have different UI, so it depends on you totally which UI you like the most. If you know, Xiaomi MIUI comes with number of features which are still not available in FunTouch UI and with MIUI 8, you can run two WhatsApp account without doing much things. The Vivo V3 has connectivity features like 4G LTE / 3G, WiFi 802.11 b/g/n, Bluetooth 4.1, GPS. The Xiaomi Redmi Note 3 has connectivity features like 4G LTE with VoLTE, Wi-Fi 802.11 ac/b/g/n (2.4 / 5GHz), Bluetooth 4.1, GPS + GLONASS. Reason to Choose: Both the smartphone has same connectivity feature but I recommend you to choose Xiaomi Redmit Note 3, it’s because it comes with infrared sensor & much cheaper than Vivo V3. The Vivo V3 measures 143.6 x 71 x 7.5 mm and weighs 138 grams . The Vivo V3 measures 150 x 76 x 8.85 mm and weighs 164 grams. Reason to Choose: By looking at the dimensions and weight, Vivo V3 has better edge over Xiaomi Redmi Note 3. I recommend you to choose Xiaomi Redmi Note 3 is because, after using it for over a month I didn’t find any problem while didn’t get any chance to use the Vivo V3 smartphone. The Vivo V3 packs 2550mAh battery while the Xiaomi Redmi Note 3 packs 4000mAh battery typically 4050mAh battery and it has fast charging support. The Vivo V3 costs Rs. 14,980 while the Xiaomi Redmi Note 3 costs Rs. 9,999 for the 2GB RAM with 32GB in-built memory and for the 3GB RAM with 32GB in-built memory costs Rs. 11,999. Vivo V3 vs Xiaomi Redmi Note 3: Which one to buy? If you look out from top to bottom (display to battery), Xiaomi Redmi Note 3 outperforms the Vivo V3. Above all, Xiaomi Redmi Note 3 is value for money when compared with Vivo V3.